Campaign touts the benefits of purple corn in the various HFI purple corn ingredients. Healthy Food Ingredients (HFI) launched a marketing campaign at the Natural Products Expo West show in Anaheim in March focused on its Suntava Purple Corn ingredients. “Unleash the power of purple” touts the benefits of purple corn in the various purple corn ingredients HFI offers. According to HFI, a 1 oz. 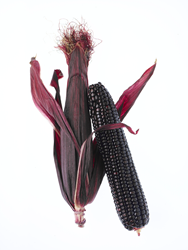 serving of Suntava Purple Corn can more than double the current daily intake of health promoting anthocyanins. And ounce for ounce, it has more antioxidant power than blueberries, acai berries and pomegranate juice. HFI also recently added flakes to its lineup of purple corn ingredients including flour, meal and grits. The flakes can be used in a variety of applications including baking, snacks, clusters, granolas and pressed bars. Like HFI’s other ingredients, the purple corn flakes are available as organic or non-GMO. Whole grain and minimally processed with natural color, the flakes lend themselves to a clean label. Healthy Food Ingredients is a growing family of global specialty ingredient brands, which includes SK Food International, Hesco/Dakota Organic Products, Suntava, and Heartland Flax. Combined, HFI offers non-GMO, organic, certified transitional, gluten-free, and identity preserved pulses, soybeans, grains, seeds, flax, expeller oils, and signature product Suntava Purple Corn®. HFI’s latest innovation, IntegriPure®, is its microbial reduction solution that means industry-leading validation for a 5-log reduction providing food safety, naturally. HFI is supported by Horizon Holdings, LLC, a San Francisco-based private investment firm with a significant track record in successfully building private and public companies.